Happy New Year! We are in full swing after our Holiday break and look forward to helping everyone with their smiles this year! Please call today to get back in and make your dental resolution a fun habit. Our growing team is ready to see you! COUNT DOWN! THIS September 21, 2019 is our 40th Anniversary! All are invited and will be in our parking lot from 12:00 pm to approximately 3:00 pm. Food, music, prizes and fun for all! We hope you can make it and bring a friend! COUNT DOWN = 5 MONTHS! Our Mission is to be the best dental office in the country. To deliver the finest quality dentistry and the highest level of service that we are capable of to our patients. We are committed to being an enthusiastic team, excited about caring for our patients and promoting a lifetime of dental health. We will always promote an atmosphere of trust, caring, and understanding for our patients. Our patient's emotional and physical well-being is our number one priority and we will strive daily to make it fun for them as well as safe and rewarding. We will always do what is best for our patients and treat them with the utmost tact, respect, and concern. We will be clear in our communication with our patients regarding treatment, finances, and education. We will continue to enhance our own knowledge and personal development through continuing education and team building to better serve the cause of quality dentistry and to truly touch the lives of the people we serve. We will always strive to be team players, knowing that together, everyone achieves more. 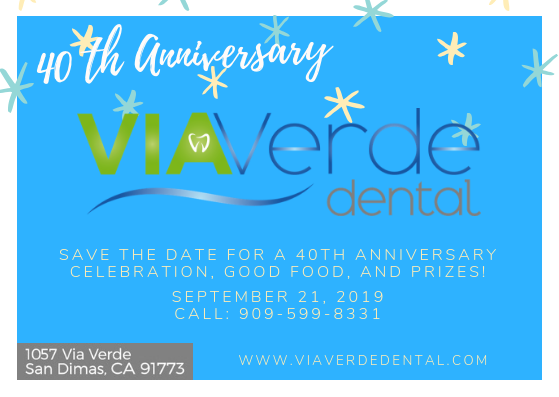 San Dimas’ Via Verde Dental is a dental practice dedicated to general, family, and cosmetic dentistry with services including dental exams, dental makeovers, teeth whitening, veneers, crowns, x-rays, fluoride, cleanings, and more. Please come and visit San Dimas dental practice Via Verde Dental.